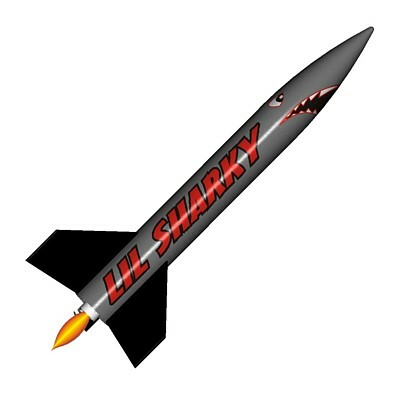 ModelRockets.us Lil Sharky Model Rocket Kit - The little brother to the Big Sharky. Easy to build larger diameter kit. Short, but not sweet. Don't in the sky when the Lil Sharky is in it. This Lil Sharky is strong and light with Polar Plywood fins and thru the wall fin mounting. The body tube is laser pre-cut for the fins and the motor mount is pre-marked by laser as well. You do not need a ruler or a knife to assemble the Lil Sharky. The Lil Sharky is an easy to build level 1 kit ideally suited for educational and group projects.